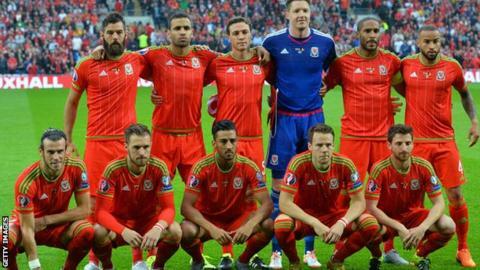 Wales start their qualification bid for World Cup 2018 with a home match against Moldova on 5 September, 2016. They end with a potentially huge home game against the Republic of Ireland on 9 October 2017. That match is just three days after a long trip to Georgia in a tough ending to the group. "We just have to make sure that our boys are focussed like they have been," said manager Chris Coleman after the fixtures were released. "It's not just the quality of teams, we're also looking at the journeys and the logistics. We have to continue on the path we've been on." Chris Coleman's side are the top seeds in Group D, and play second seeds Austria away in October 2016 and at home in September 2017. "Moldova at home is the perfect start, but there's a sting in the tail of this fixture list with the double header against Georgia away and the Republic of Ireland at home. That's a quick turnaround with a six hour flight from Tbilisi to take into account." He added he was surprised that three out of Wales' four opening games were at home. "That was a little bit unexpected," Coleman said. "I think if you look at our home form for the past couple of years it's been excellent so we have everything to look forward to. "But we've got a lot of football between now and then anyway. "We've got to finish off the job we've started with the Euros and that's what we're concentrating on at the moment. "But three games out of four at home at the start of the campaign is a little bit unusual but it doesn't matter which way they come we'll deal with it. "We're looking at the first two or three games home or away and whether you're playing the tougher ones or the ones who are deemed not so tough, it's about us performing to our potential and if we do that it will be a good start." Wales are lying 10th in Fifa's world rankings and lead Group B in Euro 2016 qualifying ahead of Belgium. They have not qualified for the final stages of a tournament since the 1958 World Cup in Sweden.